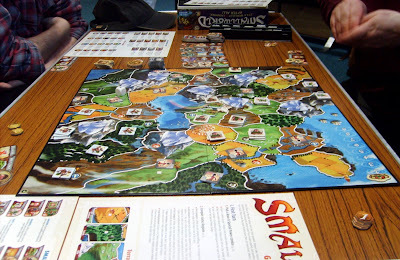 Campoon was off due to missing players so played Smallworld boardgame, from Days of Wonder, that Graeme had brought along. Played with the full five players, Graeme, Dave S, Phil, Colin and myself. All of us rookies to the game. The game plays a bit like History of the World, with empires coming and going, but this game gives you the chance to decide when to switch empires and send the original into decline. The empires themselves consist of randomly matched Powers and Races, which players can then select\purchase. 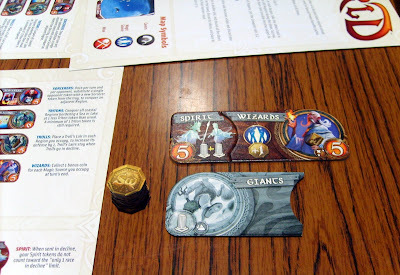 I started off with the Rich Giants, later followed by the Spirit Wizards and finally the Flying Skeletons. Those parachuting skeletons were very effective, being able to hit anywhere on the board, but didn't earn me much points after my original empires eroded. Dave S ended up the clear winner with his defensive Trolls and Sorcerers, but everyone else was close; within ten points of each other. Only after we finished did we realise that we had been playing on the wrong map board! We had played on the four player side not the five player map on the reverse, so we had played on a smaller map and also extra turns. 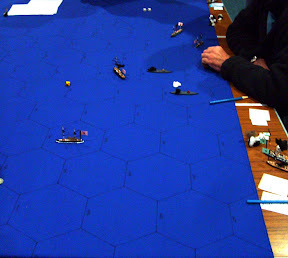 Also going on in the club, along with the regular role-players, was a Chile-Peru Naval game\mini-campaign homebrewed by Paul based on a magazine article by non-other than Jim Webster! Comments about how well Paddington's doing went straight over Martin's head.